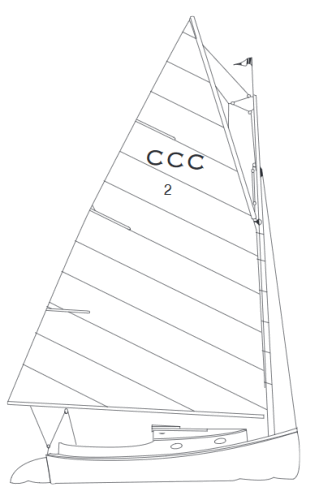 The Cape Cod Cat is offered in both a centerboard and a keel version. Although the centerboard version has slightly better upwind performance, the keel version is a wonderful compromise for more cabin space without the centerboard trunk. Both versions can have an optional outboard bracket and the keel version has an optional inboard engine. The Cape Cod Cat offers a perfect combination of day sailing cockpit space for four adults and overnight accommodations for two in the cabin. The cats beam provides a substantial amount of room overall. 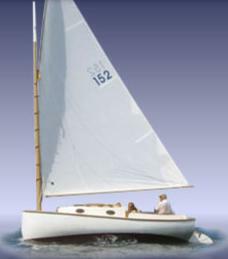 She sails best in light air with her full sail but can be easily reefed for windy conditions. Teak trim and aluminum spars allow for easy yearly maintenance and her trailer ability makes off season storage simple. Sail Area 360 sq. ft.
Running Rigging 3/8” Dacron Br.